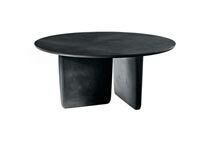 Edward Barber & Jay Osgerby first project for B&B Italia was Tobi-Ishi, a round dining table clearly inspired by Zen. 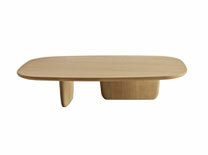 The design duo are great enthusiasts of Japanese art and culture and the name and concept for this table came from the smooth stones (tobi-ishi) used as ornaments in traditional Japanese Zen gardens. The overhang of the table and the vertical trapezoidal bases set at right angles generate an essential sculptural figure that appears to change shape depending on the point of observation.